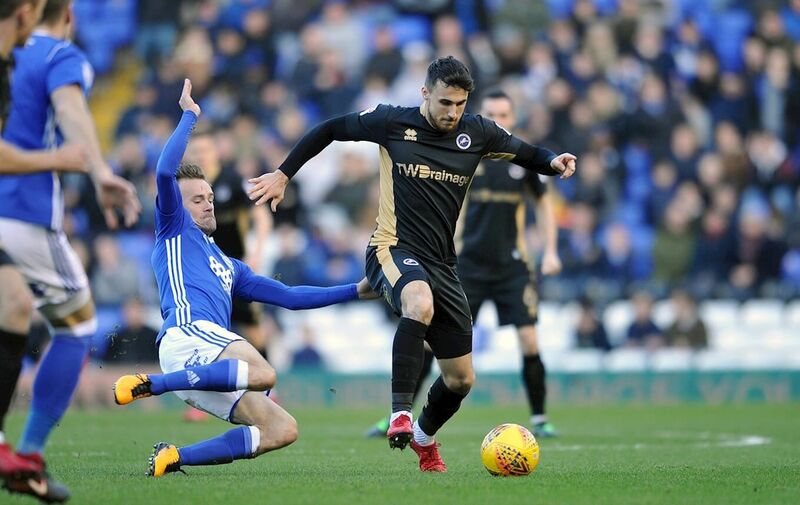 Hungry Millwall won by a goal to nil against lowly Birmingham City for their third straight away win of 2018 in the Midlands to push them still further from the relegation area. A Fred Onyedinma strike 13 minutes from the end of the game gave the south Londoners the points in a match they deserved to win. Blues goalkeeper David Stockdale made a fine save to deny Onyedinma, but he finished at the second attempt. The Lions spent 2017 relying heavily on home form in the Championship as the home form kept them away from the relegation area but in 2018 that is 9 points out of 9 as they continue searching for mid table safety which is getting closer by the match. Millwall once again set their stall early relying on defence and allowing the home team to dominate possession and playing on the counter attack up to the lone striker. Despite having only 39% of the play the Lions never looked in any particular trouble as Birmingham managed their only chance on target in second half stoppage time when Jordan Archer blocked Harlee Dean’s low effort. City are the Championship’s lowest scorers with just 22 goals and it’s easy to see why as Millwall held them off with few troubles. Meanwhile in comparison the London team had 6 shots on target as the game turned into a bit of a nibbly affair with 15 fouls per team as the Lions went closest in the first half when Marc Roberts headed George Saville’s cross come shot off the line. City have now failed to score in 16 of their 32 league matches although both sides came into the game in good form, with Blues winning four of their previous seven league matches and Millwall unbeaten in five, and their confidence showed with chances created at both ends. Birmingham had the better of an entertaining first half, with Craig Gardner’s effort deflected past the post by Saville, and Jeremie Boga’s free-kick narrowly off-target. Millwall were more attacking in the second period as Stockdale was forced to make a decent save from Jake Cooper following Onyedinma’s opener and give Millwall enormous credit they could have scored on at least two other occasions. But Millwall, who had failed to win away from home in their first 13 attempts this season, survived the pressure and their threat grew after the break and were met with little resistance from the men in blue. Millwall, who secured their first league double over Birmingham in 19 attempts, stay 14th, while Birmingham move up a place to 19th courtesy of Bolton’s 2-0 defeat at QPR. “He (Onyedinma) is up and down with his performances because he is young. But when he comes off the bench with 20 or 25 minutes to go that is the kind of impact I demand as a manager. “We didn’t play with enough zip or enthusiasm and this is what disappointed me. We didn’t play badly, but we didn’t perform anywhere near the level we have previously achieved. We looked flat and the ground was quiet with no atmosphere. Millwall have now broken the away day hoodoo and are almost guaranteed Championship football next term. Harris and his merry men are marching confidently.